At one time, these entries ran on our US Coin Values Advisor blog page, and have been archived here. Nov 2017: Rare Coin Values Index Finally Passes the 400 Level! Oct 2017: Rare Coin Values Index Poised to Breach the 400 Level? Is the 1793 Chain AMERI. Cent a "Sleeper Coin?" Does the CAC Green Sticker Add to a Coin's Value? Rare Coin Values Index Begins U-Turn in April? 1907 Ultra Hi Relief St Gaudens Double Eagle Fails to Sell? Ancient Coins vs. US Coins? Are Modern US Commemoratives Good Investments? New US Coinage Coming in 2015? The 1933 Double Eagle is one of the most valuable gold coins ever. The Rare Coin Values Index (aka RCVI) closed out the year by inching forward a microscopic 0.07 points to finish the year at 415.60, its highest level ever attained. This was the 7th record setting month in 2018. As impressive as that may sound, the Index gained only 11.76 points for the year, calculating to a 2.91% increase. Still beats most money market funds, these days. That gold coins did the best in 2018 should not surprise anyone. IMHO, genuinely rare U.S. gold coins (like those above) are the most consistent subset of solid advancers in the numismatics universe. I’ve got a website chocked full of long-term pricing data demonstrating this effect. With scarcity, high demand, and historical significance, a collector simply cannot go wrong in purchasing key date U.S. gold. One big warning: Never, never, NEVER buy a valuable coin from someone whose integrity might be questionable. There may be more clever con artists today than ever before selling evermore convincing fakes, so stick to dealers with sterling reputations. My site has advice on finding honest dealers. I wouldn’t shy away from any of these, despite their recent slump. If anything, today’s prices represent an opportunity to buy at a temporary discount. Wishing you all a Merry Christmas and see you in 2019! The Rare Coin Values Index hopped 1.39 points higher in November 2018 to close at 415.53. While no one should confuse this for a kangaroo leap, (it was more like a little bunny hop), it was enough to land the Index at another new record high. What is the goal of this Index? In a nutshell, the Index tracks the combined monthly performance of 87 key date coins in an effort to gauge the overall price movement of the United States rare coin market. In other words, are rare coin prices in general moving up, down, or staying the same? 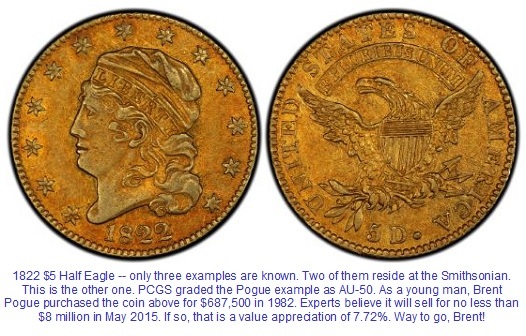 Regular issue dates from the Half Cent to $20 Double Eagle are included in the Index. The baseline of the Index is January 2000, so this month's reading of 415.53 indicates the combined prices of all 87 coins in the Index are about 4.16 times what they were in January 2000. At the risk of sounding like a crooked coin telemarketer from the 1980s, it might be fun to compare the Rare Coin Value Index (a.k.a. RCVI) performance to the DJIA. Let's imagine all 87 key date coins tracked in the Index were somehow equally weighted in a mutual fund of sorts called RCVI. Over the last 10 years, RCVI gained just under 15%. Not good, especially when juxtaposed with the Dow, as it powered its way to a 190% improvement over the same time period. Over a longer time frame, the favorability rating flips. Since its inception in January 2000, the RCVI has increased by 316%, outshining the Dow, which rose "only" 144% during the same period. Most of the RCVI's gains occurred during the rare coin bull market of 2003-09. It is important to note the RCVI has NOT surrendered those gains, unlike previous run ups in the late 1970s and again in the late 1980s. That is because the 2003-09 raging bull was fed by sound fundamentals (more consistent grading and supply vs. demand forces impacted by true scarcity), whereas earlier booms were fueled by speculator activity and over hyped expectations. Bottom line: Enjoy your coins, read up on them, choose your purchases wisely, and you'll end up with an enviable, valuable collection. For retirement planning, follow the advice of a good financial planner. A change of 0.00 might seem like a bit of a statistical oddity, but of the 223 months this Index has been tracking rare coin market activity (dating back to January 2000), there have been 36 instances when there was no movement from one month to the next. Most generally, the Index does not move rapidly in one direction or the other. But there has been a bit of volatility in the tracking history. The biggest point drop ever occurred in January 2015 when the Index lost 7.48 points, or 1.95% of its value. The best month was June 2008, when the Index exploded for 28.46 points, or 8.89%. As regular readers know, the Rare Coin Values Index tracks the price movements of 87 key date United States rare coins, then combines their overall performance to arrive at a composite score, in an effort to gauge the direction and strength of the U.S. rare coin market. The Index uses January 2000 as its baseline (i.e. the Index score that first month was 100.00). Regular issue coins from the Half Cent to $20 Double Eagle are represented in the Index. My website, US Coin Values Advisor, publishes price trend data going back to 1950 for a large number of collectible United States coins. Many collectors dig through this data to identify which coins have the best chance of increasing in value over a long period of time, based on historical performances. The Rare Coin Values Index rebounded from a couple of moribund months, rising 0.86 points in September to 414.14. Isn't that number kinda like a palindrome? Don't know what a palindrome is? Google it, or better yet, use Duckduckgo.com (where they promise to respect your privacy). When creating the Index years ago, I purposely featured many key date coins in lower grades (G and VG), because that is where most of us ordinary collectors are. Rare, key date coins in the highest grades are priced above what most of us can afford. However, many of us can relate to same coins in G and VG. As for value appreciation, yes, key date coins in the highest grade will increase in value greater in terms of raw numbers, but not necessarily in terms of percentage. For example, a coin valued at $1000 in a high grade that increases 40% over a 5 year period has a value increase of $400. If the same coin in a lower grade worth $100 increases in value by $50 over the same 5 year period sees an increase of 50%. So while the lower grade coin has a value increase of $50 versus $400 for the higher grade coin, it actually does better in percentage comparison. This sort of thing is very common. If you study the Coin Value Tables on my site, you will see the higher grades for a given key date do not necessarily appreciate at a greater percentage rate compared to its lower grade counterparts. Speaking about high grade stuff, did you hear about the August 15 sale of the finest known (PF-66) ultra rare 1913 Liberty Head Nickel? It went to a new home at a cost of $4.56 million. Sounds impressive, but when you learn the exact same coin (called the Eliasberg specimen) last sold in 2007 for $5 million, it shows even stratospheric rarities are not immune to stumbles. FYI, the Eliasberg nickel sold for $1.485 million in 1996, so that's is still a 5.67% gain annually over the last 22 years. As regular readers know, the Rare Coin Values Index tracks the price movements of 87 key date United States rare coins, then combines their overall performance to arrive at a composite score, in an effort to gauge the direction and strength of the U.S. rare coin market. The Index uses January 2000 as its baseline (i.e. the Index score that first month was 100.00). Regular issue coins from Half Cent to $20 Double Eagle are represented. The Rare Coin Values Index did something it hasn't done since March-April 2017, and that is to lose ground in two consecutive months. The August 2018 Index came in at 413.28, down only 0.55 points from July and 1.09 from its most recent record high in June. Really nothing to wax concern over, so put away your Paraffin for now. Because the United States rare coin market is but a minor player in our overall universe, it doesn't get heavily politicized, thank goodness. Otherwise, with this speck of negative news, there'd be people pushing innocent bystanders out the window to create a climate of hysteria in an effort to convince you to jump out of the window too. Personally, I think the most negative thing happening in the world of coin collecting is counterfeiting. While I get a few readers sending me pics of amateurish fake coins, there are some con men globally that have gotten highly talented at fabricating replicas of rare coin dates. Some of them are encased in counterfeited PCGS and NGC holders! Thankfully, we have pros on our side who have commensurately developed their skill sets to keep up with the fraudsters. Don't be afraid to purchase rare coins for fear of counterfeiters. The best advice to avoid this and other potential pitfalls is to deal with reputable coin sellers. I have a section devoted on my site where you can learn more about finding reputable dealers. For those of you who may be new readers, the Rare Coin Values Index tracks the price movements of 87 key date United States rare coins, then combines their overall performance to arrive at a composite score, in an effort to gauge the direction and strength of the U.S. rare coin market. The Index uses January 2000 as its baseline (i.e. the Index score that first month was 100.00). Regular issue coins from the Half Cent to $20 Double Eagle are represented in the Index. The Rare Coin Values Index took a bit of a breather in July, dipping a measly 0.54 points to land at 413.83. Over the last year, we've become accustomed to pale green arrows pointing up, so this month's reading is somewhat of an anomaly. A minor irritant, kinda like what happens when you bite into a sandwich not knowing there is a jalapeno pepper hiding in there (at least for me, it's that way). Or maybe it's just the doldrums of summer. Some people have asked me about the future of the coin hobby. There is some concern the demographics of the collector base (seemingly mostly older guys) does not bode well a couple of decades down the road. Sure, its the old guys doing the lion's share of numismatic buying and selling, but that has always been the case because that is the group with the largest amount of discretionary income. Plus, in general, America is becoming grayer. There are more young people enthusiastically involved in coin collecting today than meets they eye. Hobby leaders are actively engaged in outreach projects designed to get teenagers interested in coins. And they are having success. The American Numismatic Association recently completed their summer education program for Young Numismatists. All sessions were well attended by motivated kids hungry to learn. Don't believe me? Check out the Seminar Report Page and scroll down a bit. See what I mean? It's not just the ANA that is making inroads with younger folks. Social media is crammed with coin collecting bustle. There are tons of organizations and individuals involved, too many to keep track of. Facebook alone has millions of self identified coin collectors. These aren't all just a bunch of old fogies, either. Gone are the ubiquitous coin shops and neighborhood coin clubs and shows. They didn't vanish due to lack of interest, they've simply been replaced by more modern means of communication. And that's not to say brick and mortar shops don't exist anymore; they do, but in smaller numbers than 50 years ago. Coin collecting will NOT be extinct one generation from now, but the hobby HAS changed compared to when many of us were kids. Today, collecting interests are connected through the Internet. On balance, numismatics may not be as personable as it once was, but cyberspace has literally opened up an a new world of opportunities. The Rare Coin Values Index moved higher again in June, climbing 2.82 points to reach yet another record high at 414.37. The Index has been positive 10 out of the last 12 months. If a baseball team wins 10 out of 12 games, we'd be talking about a potential contender for the World Series... unless the team was, say, the Cincinnati Reds, in which case we all know this is a temporary aberration that will quickly correct itself back to consistent mediocrity. I have a confession to make. Last month, I made a mistake for the first time ever. More specifically, I erred for the first time ever in computing the Index score. In May, the Index score was reported at 411.92. In actuality, it was 411.56. Not a major blunder, but a goof nonetheless. I'll blame the miscalculation on my computer. This keyboard has been funky for some time now. Not all the Excel formula cells were highlighted before copying over from April to May, leaving out a few data points that should have been included in the calculation. I dunno, maybe if more people visit my website US Coin Values Advisor, I could afford another keyboard (a new computer would be even better!). New readers may ask what exactly is the Rare Coin Values Index? Let me explain, in the briefest of terms... The Index tracks the price movements of 87 key date United States rare coins, then combines their overall performance to arrive at a composite score, in an effort to gauge the direction and strength of the U.S. rare coin market. The Index uses January 2000 as its baseline (i.e. the Index score that first month was 100.00). Regular issue coins from the Half Cent to $20 Double Eagle are represented in the Index. Although the Rare Coin Values Index had its best month since 2016, it's not as if it thumbed a ride atop a Saturn V booster rocket. Read on. In May 2018, the Index climbed 4.47 points to hit another all time high of 411.92. That's the best one month point performance since September 2016, when the Index improved by 5.09 points. Although May's jump of 4.47 points (that's a 1.1% gain) is a welcome deviation from the rather mundane (but steady) performance of the rare coin market over last couple of years, when put into perspective, it rates nowhere near the best in the history of the Index. The Rare Coin Values Index tracks the combined price movements of 87 key date United States rare coin since January 2000. In the 220 months since then, the biggest one month jump occurred in June 2008, when the Index catapulted 28.46 points (an increase of 8.9%). The second best month was May 2006, when the numbers were 17.98 and 7.3%. In fact, 11 of the best 12 months in the history of the Index happened during the boom years of 2003-09, the last big run up for the rare coin market. In terms of points gained, May 2018 ranks 25th on this list. Now you understand this is not a Saturn V rocket booster month. Once again, the Index was pushed higher in May by advancing key date U.S. gold coins. If someone asked me if I could provide just one piece of advice for aspiring collectors seeking coins destined to rise in value faster than average, I would steer them toward key date U.S. gold coins. 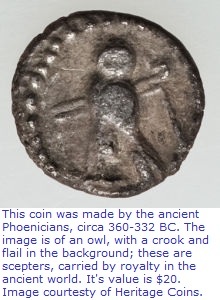 Some examples of good dates to acquire are found in the roster of 87 coins tracked in the Index. From there, you can branch out to study individual coin charts in detail. As you'll see, most have an impressive record of price hikes, some spectacularly so. Another good place on my site where you learn about rare gold (as well as other key dates coins) is US Coin Types section. As you will quickly note, the price tag for high demand/low supply gold coins is quite a bit higher than stuff you'll find in the dealer bargain bin. Consider this: It is far better, IMHO, to buy a rarity like a 1861-D Coronet $5.00 Half Eagle for $15K than 150 common date collectible coins for $100 each. That's all for this month. I'm heading down to the launch pad to see if any Saturn V rockets are getting fueled up. Have you ever stubbed your toe? Hurts, doesn't it? But there are varying degrees of "toe stubbness". Sometimes it hurts so bad you see stars and cut loose with a string of expletives. Then there are times where the pain spikes for a few seconds and then subsides quickly. And then you get on with life as if nothing happened. April was like a nuisance toe stub for the Rare Coin Values Index, falling just 0.28 points, from 407.72 to 407.44. Meh. One of the most boring months in the history of the Index. I'll update the Rare Coin Values Index again in May. Until then, watch out for stubbed toes! Ho ho ho, it's four in a row! That is, the Rare Coin Values Index has risen in four consecutive months, reaching yet another new all time high in February at 407.44 when it added another 1.46 points. To be sure, these are baby steps. Maybe not even a crawl. Over the course of the four month streak, the Index has advanced 2.2%. Over the last 12 months, it has improved only by a measly 3.2%, so at least we can say the gains are picking up the pace a little more as of late. To put things into perspective, during the first 12 months of the big rare coin bull market of 2003-09, the Index shot up by almost 54%, absolutely dwarfing the 3.2% gain over the last 12 months. No one should be discouraged. In fact, might be a good idea to add more coins to your collection. The force pushing prices higher, albeit slowly, is coming from bedrock coin collectors. They are the salt of the earth in numismatics. Back in the late 1970's and again in the late 1980's, it was these collectors who were elbowed aside by herds of speculators trying to make a quick buck in coins. People who didn't know the difference between a Flowing Hair Large Cent and a Barber Dime were dropping millions into US coins, pushing prices to stratospheric heights, unsupported by fundamentals of supply and demand. When the bubble popped, coin values plummeted, in some cases by 90% (though rare key dates weathered the storm the best). Outside speculators were not much of a factor in the boom of 2003-09. The impetus behind that surge was rank-and-file coin collectors, many of whom entered the hobby after finding interest in the 50 State Quarter Program. When the inevitable correction occurred, prices did not crater dramatically as they did in the previous two cycles. By the middle of 2010, the Rare Coin Value Index had drifted softly downward by about 5%. Since that time, The Index has been very stable, moving up ever so slightly. For those new readers, the Rare Coin Values Index tracks the price movements of 87 key date United States rare coins, then combines their overall performance to arrive at a composite score, in an effort to gauge the direction and strength of the U.S. rare coin market. The Index uses January 2000 as its baseline (i.e. the Index score that first month was 100.00). Regular issue coins from the Half Cent to $20 Double Eagle are represented in the Index. Lately, the Rare Coin Values Index is behaving like it thinks its the Dow Jones. That would be an exaggeration of course, because the Index is not climbing at THAT meteoric pace, but it has now closed at a record high for three consecutive months. This was last accomplished in late 2016, so its not that big of a deal, but are we at the beginning of another boom cycle? The most consecutive months of closing at a record high is 14, occurring in 2003-04. This coincided with the beginning of the last great bull market in US coins, lasting from 2003-09. The January 2018 Index score settled in at 405.97, up 2.13 points from December. Once again, strength in US rare gold coins fueled the rise. It's not just gold coins that folks are getting excited about, however. A 1793 Chain Large Cent in MS-63 grade (one of the dates tracked in our Index) sold last week at the Florida United Numismatists (FUN) convention in Tampa for an astounding $300,000. That price was so startling it generated media headlines throughout the world. The Rare Coin Values Index tracks the price movements of 87 key date United States rare coins, then combines their overall performance to arrive at a composite score, in an effort to gauge the direction and strength of the U.S. rare coin market. The Index uses January 2000 as its baseline (i.e. the Index score that first month was 100.00). Regular issue coins from the Half Cent to $20 Double Eagle are represented in the Index. I also have a Coin Types & Key Date Analysis. highlighting some of the best performing dates across the entire spectrum of regular issue United States coinage. The Rare Coin Values Index gained 3.06 points in December to close at 403.84, its highest level ever attained. Leading the charge this month was the US gold coin segment of the Index. The Index increased by 6.86 points in 2017, translating to +1.73%. However, most of that modest gain occurred during the final two months of the year. As was the case in December 2016, the year 2017 closes out on an all-time high. Perhaps Santa is stuffing stockings with rare coins to push the market higher? If so, don't forget to visit my house, Santa. All I'm asking for is a 1794 Flowing Hair Silver Dollar. Good-4 condition is fine. Certified, of course. If you run out of those, I'll happily settle for a 1796 Draped Bust Quarter in Fine-12. It's been almost 10 years since key date coins have been consistently depicted with dark green arrows everywhere pointing upward. No one can ever say for certain, but based on the timing of previous boom/bust cycles, it may not be much longer until the next big surge. We have finally hit the 400 point level. Will it take another decade to hit the 500 barrier? History says it will not. My website, www.us-coin-values-advisor.com, publishes price trend data going back to 1950 for a large number of collectible United States coins. Many collectors dig through this data to identify which coins have the best chance of increasing in value over a long period of time, based on historical performances. In November 2017, the Index gained a modest 2.06 points, but that was enough to push the Index north of 400 for the first time ever. It's kinda like the Dow finishing above 20,000 for the first time, but without the obnoxious closing bell and foaming-at-the-mouth Pavlovian-like traders screaming on the floor. Although we have come close to the 400 point plateau several times, it has never been crossed until now. Relatively speaking, it took a long time to get here. It was September 2007 when the Index hit 300, and from there, 122 months passed before reaching the 400 milestone. IOW, it took more than 10 years for the Index to increase by 33%. By comparison, it took 46 months to go from 100 to 200 (a 100% increase) and only 35 months from 200 to 300 (a 50% increase). Much of this growth occurred from 2003-09, considered the last big bull market for rare US coins. Why did it take so long to get to 400? It's because coin prices move in cycles. Although the Rare Coin Values Index charts the movements of 87 key date US coins every month since January 2000, we have data going back to 1950. Period of robust growth lasting for a few years were all followed by a longer cooling off interlude (sometimes initialized as ugly crashes, like we saw in the early 1980's and early 1990's). For months now, we've been eyeing the possibility of the Rare Coin Values Index finally breaching the 400 point level. The Master of Ceremonies checked the microphone, ready for the big announcement. The band was warming up to a lively Sousa march, ready to herald a new era. Drummers ready to roll. Surely October was to be the occasion to reach an historic stratospheric altitude, on par with Chuck Yeager breaking the sound barrier in 1947. The fanfare will have to wait at least one more month. In October, the Index fell 0.66 points to close at 398.73. The 400 point territory remains unchartered space, for now. In September 2017, the Rare Coin Values Index jumped 3.86 points to 399.39, the closest flirtation ever with the 400 point barrier. Was it the act of flirting that aroused the Index from its year long slumber? Probably not a valid consideration, LOL. The 3.86 gain is the best monthly showing over the last 12 months. Strength in gold coins over the last month was the catalyst that pushed the Index to its highest level ever. The broad based U.S. rare coin market has exhibited minimal growth over the last 8-9 years, and now stands like a coiled cobra ready to strike. This is in keeping with other market cycles in the past. To reap the benefits of the inevitable price explosion, the most important thing for collectors to remember is to 1) acquire key date coins with proven long term demand (the 87 coins charted in the Index is a good place to start), and 2) deal only with reputable sellers providing properly graded, certified coins. Learn more at www.us-coin-values-advisor.com/coin-buying.html. Also, the American Numismatic Association (www.money.org) is a valuable resource for locating honest dealers. In case you're new to my blog, the Rare Coin Values Index tracks the price movements of 87 key date United States rare coins, then combines their overall performance to arrive at a composite score, in an effort to gauge the direction and strength of the U.S. rare coin market. The Index uses January 2000 as its baseline (i.e. the Index score that first month was 100.00). 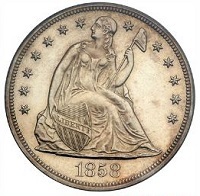 Regular issue coins from the Half Cent to $20 Double Eagle are represented in the Index. If the Rare Coin Values Index was an EKG readout, it would be a flat liner and the patient sent to the morgue. Wellllll, that's not a real good analogy, but the point is that there just ain't much extraordinary happening overall in the rare United States coins. This is not necessarily a bad thing, however. Steady as she goes, ready for the sails to catch the next gust of wind. In August 2017, the Index gained 0.71 points to reach 395.52. This is the first time since late last year the Index has posted back-to-back monthly gains. Over the last 12 months, the Index has floated along in a very narrow band between 394.37 and 396.98. The 400 point plateau has been threatened repeatedly, but never breached. Just as we reminisce about passing the 300 point milestone in September 2007, we'll be someday laughing at how long it took to finally blow past 400. That's 119 months. For the record, it took 46 months to go from 100 to 200 and only 35 months from 200 to 300. To be sure, activity is hot elsewhere. In the ANA annual show earlier this month, a 1794 silver dollar graded MS-64 brought an astounding $2.82 million, along with plenty of other highlights. The last time this gem sold (1988), it sold for $242K. That's growing at an annual clip of 8.84%, but who's counting? Modern numismatic products marketed by the U.S. Mint are flying off the shelves as well. The Rare Coin Values Index tracks the price movements of 87 key date United States rare coins, then combines their overall performance to arrive at a composite score, in an effort to gauge the direction and strength of the U.S. rare coin market. The Index uses January 2000 as its baseline (i.e. the Index score that first month was 100.00). The Rare Coin Value Index in 2017 continues to show about as much gusto as a four-year-old being forced to eat cauliflower. The Index rose a meager 0.32 points in July to 394.81. Is broccoli on the menu for August? For the year, the Index is down just 2.17 points, so do not pull the Chicken Little costume out of the closet just yet. The year 2017 isn't much different from what we've seen since 2009, when the last big run for coins ended. Since then, the Index has gained less than 25 points, translating to less than one percent growth annually over that time. Coin prices DO move in cycles. Although the Index charts the movements of 87 key date US coins every month since January 2000, we have data going back to 1950. Period of robust growth lasting for a few years were all followed by a longer cooling off interlude (sometimes initialized as ugly crashes, like we saw in the early 1980's and early 1990's). It's now been eight years that coin values have been in a state of semi-dormancy (at least at the level where most of us ordinary collectors dwell. The stratosphere of numismatics -- think Pogue -- seem to be breaking price records left and right). All I can do is guess, but based on the timing of previous boom/bust cycles, it won't be much longer and we'll see the Index shatter the 400 point level, rocketing toward the 500 barrier. The long term price trends of collectible coins is upward, most especially for key date coins. Someone recently mentioned to me that rare coins are not the best investment vehicles. I agree and it's wise advice never to put all your investment eggs in a numismatic basket. The primary goal of my research is to help coin collectors figure out which coins have the best chance of increasing in value over a long period of time, if that is something that interests them. I think it's a fair statement that many, if not the majority, of collectors buy coins in the hope they'll someday be worth considerably more than what they paid for them. Coins are a wonderful pastime, to be enjoyed for their history, beauty, and vast educational opportunities. An astute, well informed hobbyist can reap these benefits while simultaneously assembling a collection that also shines on the family balance sheet. The Rare Coin Value Index couldn't generate any positive momentum from the flat tire bounce it got in May. The June scores comes in at 394.48, down 0.50 points from last month. Since September 2016, the Index has moved along in a very narrow band of 3.62 points, so there has not been much movement one way or the other for almost a year. Stability has mostly been the story for the Index since the Autumn of 2009, when the historic rare coin bull market of 2003-09 came to a halt. Since October 2009, the Index has grained only 10.7%. Not so hot, when spread out over an eight year period. It's really not so bad, if one considers the long term record. Please continue reading. US Coin Values Advisor has coin price data going back to 1950, researched from the library of the American Numismatic Association. There have been a number of market run ups, followed often by a dramatic collapse, as we saw in the early 1990's, for example. Happily, a crash and burn did not happen when the bulls stopped stampeding in 2009. That's because the 2003-09 price run up was based on numismatic fundamentals (rarity, quality, demand). What occurred in previous price explosions is that speculative forces (not bedrock collectors) artificially drove the market to great heights by promoting overgraded, generic material. And then reality sunk in and the bottom fell out. Historically, every bust has been followed by a boom. At some point, this market is going to take off again, with prices spiking everywhere. The 400 point Index ceiling will be shattered as we zoom toward 500. No one should be alarmed that prices have been flat for practically ten years now. Rather, it should be viewed as a buying opportunity. As regular readers know, the Index tracks the price movements of 87 key date United States rare coins, then combines their overall performance to arrive at a composite score, in an effort to gauge the strength of the US rare coin market. The Index uses January 2000 as its baseline (i.e. the Index score that first month was 100.00). So far in 2017, the Index movement has been reminiscent of a snail racing through a jar of molasses. IOW, very slow, and mostly sinking. May was the first positive month of the year for the Index, gaining 1.63 points to close at 394.99. Since the end of 2016, the Index has fallen only 0.5%. That's one-half of one percent, folks. See what we mean about the snail and molasses? Will we ever see another incredible rare coin market ala 2003-09? No one can say for sure, but keep this in mind: for as far back as we can find records, every stagnant or negative period of coin value trending has been followed by surge in prices (especially for key date coins). It is cyclical, as is just about everything related to money. One thing rare coins has going for it that stocks and bonds don't is the joy of the pursuit. The coin hobbyist who delves into history, value trend research, while developing an eye for quality crosses into the realm of numismatist, and is well positioned to capitalize on inevitable price rallies. The Rare Coin Value Index is based on the combined percent change in retail prices for 87 rare United States coins and is updated monthly. The year 2017 continues to show weakness. The year is now about 1/3rd over, and we still have not seen a winning month. The Index dipped another 1.55 points in April, closing at 393.36. That's four consecutive months of losses for the Index. The last time that happened was May-August 2009, which marked the end of the great coin bull market of 2003-09. No need to jump out of a tall building just yet. Losses so far in 2017 amount to 3.62 points, down less than 1% from December. The year 2017 has started off weakly, posting slight losses in the first three months. The March Index score came in at 394.91, down 0.54 from February. No drama here, but the Index has now posted losing numbers for three consecutive months. The last time this happened was August-October 2015. IF, and that is a big IF, the Index falls again in April, it will mark the first time since May-August 2009 the Index lost in four consecutive months. It should also be noted that the losses so far in 2017 COMBINED amount to only 2.07 points, or only about a 0.5% down from where the Index finished in 2016. A trend? Not hardly, more likely just statistical noise. The year 2017 started off on a weak note as the index fell 1.38 points in January to 395.60. That loss broke a six month winning streak for the Index, its longest since 2008. The Index moved downward again in February, though by a tiny 0.15 points, to 395.45. Nevertheless, it was a loss, and for the first time since December 2015-January 2016, the Index has registered a negative number in two consecutive months. If your goal is to buy coins today with the expectation of seeing them gain in value over time, here are the basics: Buy properly graded, key date coins with long established records of demand from rank-and-file coin collectors. This does not mean any coin fitting this description will do nothing but go up in value all the time. To the contrary, some of them stumble a bit before resuming their normal pattern of higher prices. 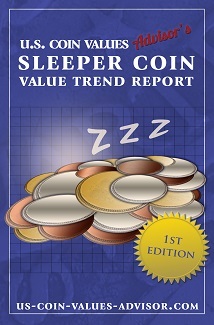 In fact, we have compiled a data-driven "Sleeper Report" highlighting rare US coins whose values have temporarily receded. Our website, US Coin Values Advisor, contains a great deal of historical pricing information to assist coin enthusiasts with an eye toward the future in making their purchasing decisions. All the information is available at no charge (but we hope you don't get too annoyed at the advertisements running on our site!). 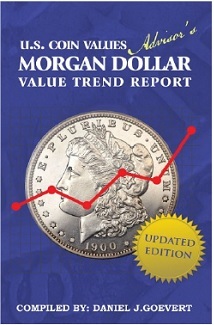 The Morgan Dollar Value Trend Report has been updated for 2017. The report shows how retail prices have changed since 1950 for individual dates of the Morgan Dollar series, across a wide spectrum of grades, ranging from Fine to Proof. Collectors seeking to purchase Morgan Dollars with the best potential for future price appreciation will find this report a valuable tool. Most dates have demonstrated a lackluster performance, while a few key dates have found favor with coin buyers over a long period of time and have consequently enjoyed much more impressive gains. The report includes a "Collector Index" score for every date and grade, making it very easy for you to spot "Blue Chipper" Morgan Dollars with the best track records and hence the best potential for the future. The "Collector Index" feature is something a little extra and is exclusive to our downloadable PDF reports. Our website, US Coin Values Advisor, contains a great deal of historical pricing information to assist coin enthusiasts with an eye toward the future in making their purchasing decisions. In addition to Morgan Dollars, many other popular US coin groups are analyzed. All the information is available at no charge, other than the PDF reports (please excuse the somewhat annoying ads, but they do help pay the bills!). These tables report how retail prices have changed over a long period of time for nearly every date in the group, over a wide spectrum of grades. This data is especially helpful for collectors seeking to select dates with the best potential for future price increases. Dates that have done well over a long period of time are also the same coins with the best odds of continued price advancements. The year 2017 started off with a whimper, as the index fell 1.38 points to 395.60. The loss broke a six month winning streak for the Index, its longest since 2008. Thus, the 400 milestone is safe for another month. A survey conducted by Professional Numismatists Guild suggests United States coin market activity (not including bullion or US Mint sales) totaled more than $4 billion in 2016, with some weakness (compared to 2014-15) detected at coins valued at the $100K altitude and above. The Rare Coin Values Index attempts to gauge the environment where more ordinary collectors dwell, and from our vantage point, interest in rare coins remains consistent, at the least. The Index registered positive in 10 out of 12 months in 2016, albeit all gains were modest. That 2017 began on a negative note, in no way portends a downward trend. Let's see how things look in a couple of months. In December 2016, the Rare Coin Values Index extended its monthly winning streak to six, rising 1.09 points to finish the year at 396.98. The last time the Index gained in six consecutive months was Feb-Jul 2008, when US rare coins were nearing the end of strong bull market that began in early 2003. The year 2016 was steady for rare coins, but not spectacular, despite gaining in 10 out of 12 months. As we entered 2016, the Index stood at 372.79, and gained 24.19 point through December, computing to an increase of 6.49% for the year. This is the best performance since 2011, when the Index rose 7.34%. A completely unscientific supposition here: Most numismatic professionals prefer a slow, methodical upward pace, compared to a mad dash fueled by speculative forces. As we saw in the 1980s and 1990s, extreme price surges based on non-fundamental numismatics end in crashes, devastating to hobbyists and investors alike. We anticipate 2017 to be similar to 2016, as ordinary collectors continue to form the foundation of US collectible coin buying activity. For those who may not be familiar with the term "Sleeper coin", think of it as a highly collectible, rare coin being sold temporarily at a bargain price, generally due to normal fluctuations in supply and demand. Sooner or later, it will reassert itself and jump in price, but at the moment, it is being sold for less than what it normally does. The problem most Sleeper coin seekers run into is how do they know when they've found a coin temporarily depressed in selling price? Without value trend data from the past, the selling price of today cannot be put into historical context. Because I have many years of numismatic value trend research under my belt, I can recognize a Sleeper coin when I see one. That's why I've produced the Sleeper Coin Report. With this data, collectors can save hundreds, if not thousands of dollars in their quest to add quality dates to their numismatic holdings. To learn more about the Sleeper Coin Report, click the link below and visit the info page on my site, US Coin Values Advisor, where you can get more details and see a sample Sleeper Coin chart and supporting data. The Rare Coin Value Index moved down again in December, falling 0.88 points to 372.79. Yes, it was a down year for rare coins, but not at all catastrophic. On a positive note, rare coin values held relatively steady in the midst of an uncertain economy. It's good to see coin collecting has maintained its broad appeal, and most likely will continue to do so as far as the eye can see. The Rare Coin Values Index is based on the price movements of 87 United States coins deemed to be key dates by rank-and-file collectors, using January 2000 as its baseline. This time of year I usually get a few requests from readers seeking advice on Christmas gifts for avid coin collectors. The best stocking stuffer recommendation I can think of is a rare coin destined to rise in value in the years ahead. That would be a cherished heirloom for the ages. On the flip slip, if you're not careful, your heartfelt gift may amount to nothing more than a lump of coal. Thankfully, there are good options for coin gift givers of all means. It is not necessary to spend a ton of money, though you certainly can if you want to. For less than the price of a 32 inch flat screen TV, your beloved collector can own something of sustainable intrinsic value. It won't be obsolete in a year or two, yet will coveted by future generations of collectors. Santa's elves are always making new TV's, but there will never be more 1916-D Mercury Dimes than what we have now. So, if a coin is on your Christmas shopping list, congratulations on being forward thinking. Now the next task is to chose wisely. I have compiled a list of coins bound to generate smiles on Christmas morning. The Rare Coin Value Index stayed put in November, coming at at 373.67, no change from October. Nevertheless, the Index remains at its lowest reading since November 2011. The Index charts the price movements of 87 United States coins deemed to be key dates by rank-and-file collectors. Although market activity at the base level of coin collecting has been rather stagnant for several years. it hasn't been bad either. It is encouraging to see the base of the hobby holding steady. 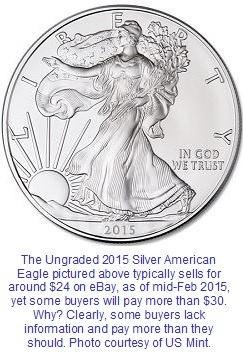 New guidelines to assist buyers of ungraded $1 American Silver Eagles have been posted. For the last nine months, we've been gathering Silver Eagle data from successfully completed eBay sales. In all, the results of nearly 5000 individual sales were analyzed and used as the basis for the guidelines. The guidelines are very easy to use. In the left column, look up the row with the current silver bullion price. In the same row in the right column, you'll find the estimated maximum bid price for a one ounce Silver Eagle. The maximum price is based on the bullion value plus an estimated premium, as determined from the data gathered during the study. The goal of publishing the guidelines is to help Silver Eagle buyers avoid overpaying. For many, it's like they have no clue how much a Silver Eagle is worth and frequently pay 25% to 50% more than what most other buyers are paying to acquire the exact same thing. When family dinner, sports, and numismatics converge, good things can happen. The Rare Coin Value Index continued its slide in October, down to 373.67, its lowest reading since November 2011. The Index charts the price movements of 87 United States coins deemed to be key dates by rank-and-file collectors. As ominous as this may sound, the Index is off its all-time high attained in July 2014 by only 15.81 points, or 4.1%. The positive takeaway is that the downward trend has not been dramatic, but rather slow and gentle. In light of a shaky worldwide economy, it is encouraging to see the base of the hobby holding steady. Activity at the stratosphere heights of coin collecting is robust. The Pogue auction held on September 30 brought in $26.1 million, well above the most optimistic pre-sale estimate of $20.6 million. 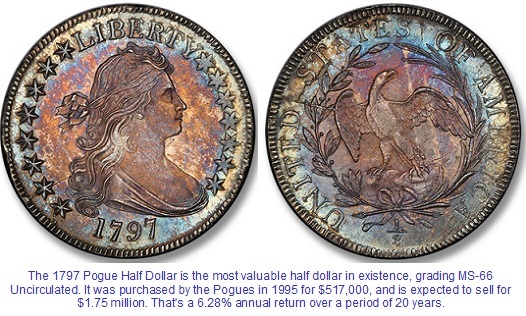 Pogue's 1794 silver dollar in MS-66+ sold for $4.99 million. The pre-sale estimate pegged the coin's selling price at $3 to $5 million. From time to time, I like to write about Sleeper coins. Because I keep so much data on historical coin value trends, I know how to recognize a Sleeper coin when I see one. For those who may not be familiar with the term "Sleeper coin", think of it as a coin being sold temporarily at a bargain price. Sooner or later, it will jump in price, but at the moment, it is being sold for less than what it really should. 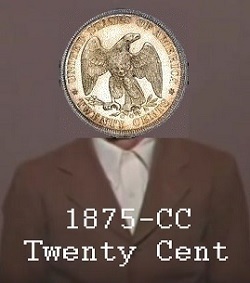 This time around, I'm focusing on the 1875-CC Twenty Cent piece. As is my occasional wont, I like to intertwine Baby Boomer nostalgia with my coin analysis. Fans of Sergeant Joe Friday and his TV series Dragnet will quickly catch on. For those of you not fortunate enough to have known Joe, I've provided a link to Youtube taking you back to 1967, so you can better understand what you missed out on. The Rare Coin Value Index tumbled another 3.22 points in September to 374.11, its lowest reading since January 2015. Highlighting the September drop was weakness in several key date gold coins. Over the last two months, the Index has fallen by more than five points, very mild when compared to the major correction in the Dow over the same period of time. Rare coin sales at the ultra high end of the price spectrum continue to make news, but at the base level where most of us collectors live, activity is rather mundane, on balance, over the last four years. Many key date coins have fallen in value, some slightly improved, yet most have gone "sideways". Was the Statue of Liberty face patterned after the Morgan Silver Dollar? It's easy to see the similarities, nor is it surprising many people believe the two are one and the same woman. 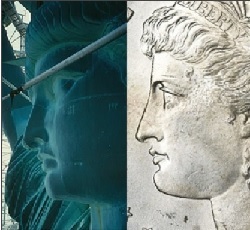 Here is something many people do not know: At the exact same time the faces for Liberty on the Statue of Liberty and Morgan Dollar were in the design phase, their creators, Frederic A. Bartholdi and George T. Morgan, were both located within a virtual stone's throw of each other, in the city of Philadelphia. Is it possible Bartholdi and Morgan collaborated on how the human facial representation of Liberty should appear, or is it just a coincidence they had many of the same ideas? The primary mission of my site is to provide long term pricing data to collectors who seek to acquire coins destined to rise strongly in value. However, I'm into more than just numbers and value trend lines; I enjoy writing about United States history and how it connects to our coin heritage. Recently, I completed another in a series of "Coins & US History" chapters, this one covering the Reconstruction Era following the Civil War. 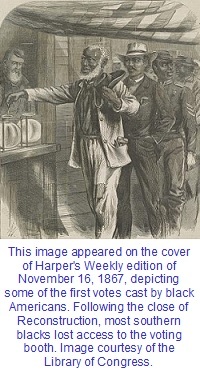 Historians generally define Reconstruction as the years from 1865 to 1877, when the last of the federal occupation troops were withdrawn from the former Confederate states. Though not as horrifying as the war years, Reconstruction proved to be a challenging time on both sides of the Mason-Dixon line. The Rare Coin Value Index stumbled 1.84 points in August, down to 377.33. Helping to bring the Index score down was the fall of the 1821 Half Eagle and 1833 Large Date Half Eagle. Previously, these $5.00 gold pieces had risen literally off the charts. This month they've lost a bit of altitude, but in terms of price performance, they are still far above most coins tracked in the Index (and far above the vast majority of United States coins, for that matter). Following a poor Q4 2014 and a bad start into 2015, the Index has been fairly stable since April, when it registered 377.71. Our Rare Coin Values Index tracks a selection of 87 United States collectible coins from Half Cents to Double Eagles. The goal of the Index is to measure the pulse of the hobby at the grassroots level. The 1793 Chain AMERI. 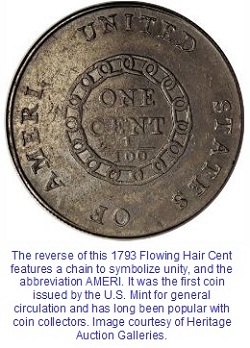 Flowing Hair Cent was the first United States coin issued for regular circulation. The significance of this coin, in conjunction with its scarcity, has made it a collector favorite for over 150 years, and it has one of the best long term records of price increases to prove it. Despite its glittering biography, the last few years have not been rosy for this early United States copper, as it has lost one-third its value. Can we now call it a "sleeper coin?" If so, bargains await for the perceptive buyer, as this artifact from the earliest days of the U.S. Mint is certain to make a strong comeback. The Rare Coin Value Index rose to 379.17 in July, up 1.66 points from June. Following a poor Q4 2014 and a bad start into 2015, there was some concern the rare coin market would display an extended period of weakness, but those concerns have not materialized. This is not to say we are heading into a strong market. To the contrary, many coins tracked in our Index are mired well below their highs from 2009, but their stagnation has been offset and then some by strength in other areas, notably gold coins. At the six and seven figure level, rare coin activity remains robust, with a steadly pipeline of major auctions featuring fabulous rarities in the offing. 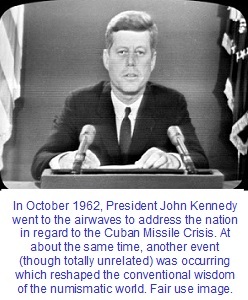 The most memorable event from October 1962 is the Cuban Missile Crisis. The world watched nervously as the Americans and Soviets inched closer to war, stemming from the Soviet's decision to place nuclear missiles on the island nation of Cuba. Another story garnered a few headlines in October 1962 as well. Though not as tensely followed as the showdown between the world's lone superpowers, it set off an explosion still being felt today in the numismatic community. Herein lies the incredible story of the 1903-O Morgan Silver Dollar. In its heyday, it was viewed as one of the rarest and most valuable of all Morgan Dollars. That all changed in the Autumn of 1962. The Rare Coin Value Index dipped minimally in June, falling 0.20 points from 377.71 in May to 377.51 in June. The Rare Coin Values Index tracks United States rare coin activity across a wide spectrum of collectible coins, most of which are attainable for collectors of average means. While buying/selling trends have been stable for quite some time now, trading in the six and seven figure stratosphere has been hot, with new records being set with regularity. The ongoing Pogue Sale demonstrates the strength at the highest levels of coin collecting. A major sub-theme of the US Coin Values Advisor site is to put in plain words the connection between the history of the United States and its coinage. Both influence and react to the other. I believe that in order to reap the full benefits of collecting, one must have an understanding of the historical significance of their coins. Let's look at seven examples of the coins/history relationship. They've been listed in chronological order. I could've come up with a lot more, but these more or less randomly pulled off the top of my head. The Rare Coin Values Index did not move in May, remaining at 377.71, same as April. The Index is comprised of 87 collectible United States coins and tracks their performance as a measure of the overall health of the US rare coin market. 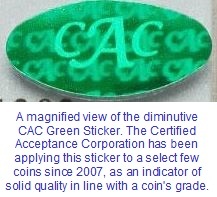 In today's coin collecting world, the CAC Green Sticker has become an indicator of solid quality. Only a select few coins earn this distinction. Is there any data to support this claim, and if so, can we approximate the value of the Green Sticker premium? This study attempts to do both. Since last October, the Rare Coin Values Index has displayed weakness, but that changed in April when the Index shot upward 2.94 points, the best monthy gain since December 2011. This is an abrupt reversal of the trend over the last six months. Now we wait to see if this is the beginning of a full-fledged U-Turn. As always, we remain confident in the long term strength of rare coins. We have many decades of pricing history to base this conclusion. What is described as the most valuable coin collection in the world held in private hands is about to put up for sale. The collection of D. Brent Pogue, consisting of 650 coins, mostly from 1792 to the 1830's, is expected to fetch at least $200 million. The Pogue collection required 40 years to assemble. The cumulative face value of the collection is $969.14. 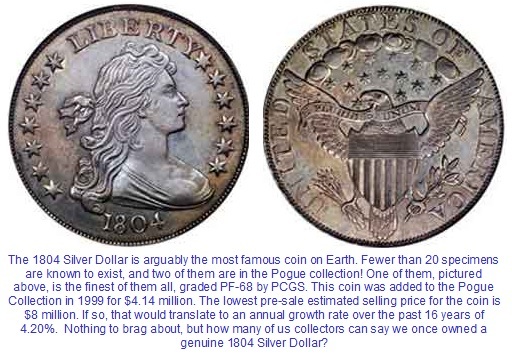 If the pre-sale estimates hold true (as they often do), the average Pogue coin is worth more than $300,000. Many of the coins are in pristine, high quality condition. Survivors in mint state grade from the infancy years of the United States are exceedingly rare and coveted by numismatists. A series of seven auctions will be held, the first of which is scheduled for May 19 of this year. The final sale is slated for May of 2017. Sotheby's and Stack's Bowers Galleries auction houses are conducting this truly historic sale. Forbes magazine has a beautiful video presentation of the Pogue Collection. There are too many extreme rarities to list. An astounding 20 coins from the Pogue Collection are expected to sell for more than $1 million. There is some evidence of weakening prices for key date rare coins in the lower to middle echelons of the coin collector universe, but at the stratosphere height, activity remains strong. This bodes well for collectors at all levels for whom future value appreciation is a central consideration. I have been an avid observer of U.S. coin market activity over a period of many years and can attest to the absolute enormity and importance of the Pogue Collection. I've seen some big sales, (e.g. Garrett and Eliasberg come to mind), but nothing approaches the magnitude of this sale. In 2016, the US Mint will be releasing a silver dollar and half eagle to commemorate American author and humorist Mark Twain. 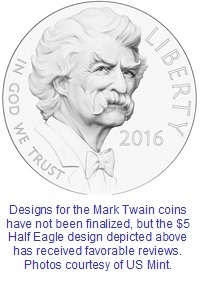 Prospective designs for the 2016 Mark Twain coins were published recently and touched off a wave of controversy. Expect the wave to reach tsunami proportions as release of the coins draws near. The movement to transform American tradition and culture into something many of us could not have imagined during our youth has been dogging us for quite some time now. The quest to eradicate the mention of God from US money has been a spearhead of the pressure groups. Up until now, the anti-religion crowd has failed in their effort to remove the "In God We Trust" motto from our money. That hasn't deterred them, however. They know from experience in other fronts of the culture war that persistence eventually leads to conquest. What seems to be emboldening them this time is the irony that Mark Twain himself hated religion and mocked the appearance of God's name on United States coinage. For the first time in a few months, we are not reporting a steep plunge in the Index score. The March 2015 Index stands at 374.77, up a microscopic .01 point from February. No one is going to cut loose with a Tarzan-like yell over a gain of .01, but at least for now, the sharp Index drops we've seen lately have been blunted. We await April with bated breath (sort of... not worried about the long term). Opportunities abound for coin collectors looking to acquire rare date coins at temporarily depressed pricing. The 1918/7-D Buffalo Nickel overdate is one such coin. In August 2010, a Good-4 specimen was retailing in the $1500 range. Today, the same coin can be yours for around $1100, down 27% since 2010. As is the case with so very many rare coins, prices move in cycles. Understanding what triggers the cycles is harder to pinpoint, but general economic conditions and fluidity in collector preferences are important influences. In looking at the pricing history of the 1918/7-D Buff in lower grades (also the most widely collected) over the last 65 years, there have been multiple up & down cycles. Losses of nearly 40% have happened before, followed by gains of 400%. None of the cycles occur quickly; one full cycle may take many years to play out. 2010 was the last peak. Will prices go lower? Maybe, but if they do, don't expect them to drop much further. When will prices turn higher? Don't know, but be certain they will, since the 1918/7-D is a crucial key date of the venerable Buffalo Nickel series. 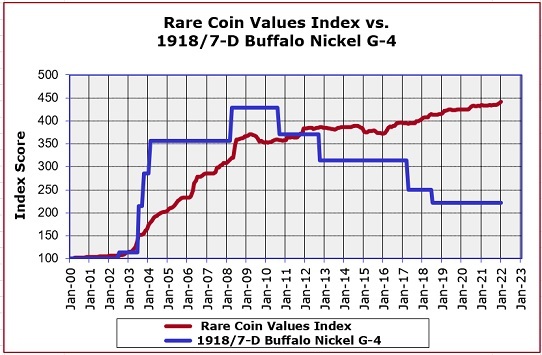 The blue line in the graph below demonstrates the plight of the 1918/7-D nickel. 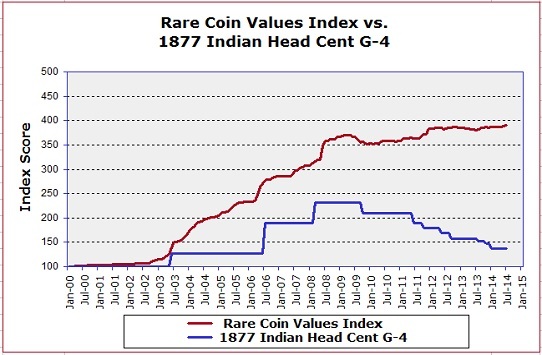 The red line charts the performance of the overall Rare Coin Values Index. We have a page that zeros in on the 1918/7-D Buffalo Nickel. Please spend a minute or two there to better understand how this little guy wormed his way into the hearts and minds of coin collectors for generations. 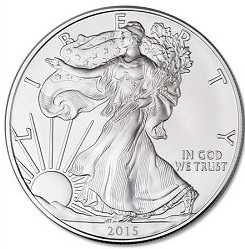 Guidelines for purchase of $1 American Silver Eagle coins are being updated weekly now. Buyers in the market for MS-69 silver eagles graded by PCGS and NGC will have fresh data upon which to set their ceiling spend limits. Ditto for Ungraded Silver Eagles. The guidelines are based on selling prices on eBay for the week, and categorized by MS-69 (PCGS), MS-69 (NGC), and Ungraded. For each category, the price range (low vs. high), as well as average and median selling prices are listed. It is obvious some buyers are acting blindly. Why pay $30 for something whose true value is around $24? This does not seem logical, but it is a common occurrence. If you are interested in Silver Eagles but unsure how much you should pay, these guidelines were prepared with you in mind. The Rare Coin Values Index tumbled 2.14 points in February 2015. This comes on the heels of a historic plunge of 7.48 points in January. The first two months of 2015 are the worst back-to-back months since August-September 2009, when the Index fell 10.69 points combined. There is no reason for collectors to think rare coins have lost their allure. It is common for the market to step back a little and cool off. The last time this happened was 2009, following an amazing rally that lasted through much of the 2000 decade. In fact, the roller coaster ride has been in effect as far back as we have data to chart progress. Unlike a real roller coaster that eventually returns to its starting point, the rare coin ride continues to trend higher. Each peak is higher than the peak that preceeded it. When I was a young collector, I took a foolish chance and bought a rare 1916-D Mercury Dime at a seedy flea market. This was long before the advent of reputable third party grading services, so my actions were doubly risky. It was a "teachable moment" for me. The 1794 Flowing Hair Silver Dollar that emerged out of nowhere in England (see blog entry of Nov 09, 2014) was sold on January 27 for $437,100. The coin was graded AU-50 by NGC and earned a CAC sticker for good measure. Spink auction house in New York city sponsored the sale. In spite of the threat of an historic snowfall, the sale took place as scheduled. The British family who owned the fabulous rarity for almost 70 years had no idea of the coin's true value, kept it as a good luck charm of sorts. In the end, it most certainly did bring them good luck. The 1794 dollar is one of the coins I carefully monitor. In Good-4 condition, it was selling for around $8000 in year 2000. In 2015, the same coin commands a price tag of $65,000. That is stunning. That computes to an increase of 14.98% annually. What is even more astounding is that the 1794 dollar tickled the six figure sum 6-7 years ago, so today's prices are actually a bargain for the buyer. Coin Value Tables for the following coin groups have been updated for 2015: Mercury Dimes, Standing Liberty Quarters, Washington Quarters, Walking Liberty Half Dollars, Morgan Silver Dollars, and Indian Head ($10) Gold Eagles. The tables show how retail prices have risen over time for individual dates within the aforementioned coin groups, across a wide spectrum of conditions. Collectors seeking to locate coin dates with best price increase histories will find the tables an especially useful tool. As experienced numismatists know, the coins that rise sharpest in value are the key dates, and these are the same coins most likely to do so in the future. The image below is a snippet from the 1889-CC Morgan Silver Dollar table. The data demonstrates this key date coin has lost some steam since its last peak in 2009. However, when its price changes are viewed from various long term perspectives (i.e. since 1950, 1980, and 1995), we see the coin has done quite well, in spite of the downturn in recent years. This is how a typical key date coin performs. The 1889-CC silver dollar has a proven record of bouncing back strongly following a decline, and there is every reason to expect the same as we enter the year 2015. The value trend data shows that NOW is a good time to acquire this rare date at a bargain price. The Rare Coin Values Index suffered its worst one month loss in the history of the Index, dating back to January 2000. The Index fell 7.48 points from December to 376.91, the lowest score since November 2011. The previous worst month was September 2009, when the Index lost 5.45 points. Two of the last three months have seen steep losses for the Index. Is it time to panic? To the contrary. We may be entering a period of good buying opportunities. 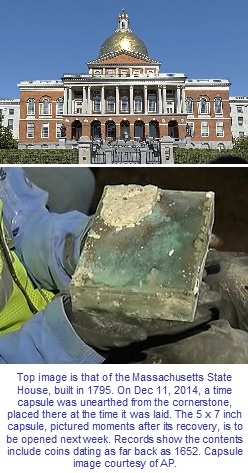 The discovery of a 1795 time capsule from a cornerstone of the Massachusetts Statehouse, first reported here on December 12, was opened last night at the Museum of Fine Arts in Boston. Details of what was inside are sketchy, but we do know they found five folded newspapers, a George Washington medal, a silver plaque, a 1652 Pine Tree shilling and about two dozen other coins, as well as the seal of the Commonwealth of Massachusetts. The items will be carefully catalogued and put on display at the museum. I will report back when the contents are more fully described. Of course, I am most interested in learning more about the coins. Massachusetts state Secretary William Galvin said he expects the items will eventually be returned to its hiding place to be someday discovered by a future generation of Bay State residents. I have been a member of the American Numismatic Association (ANA) for over 30 years. During that time, among other activities, I have made use of their vast numismatic library, as a valuable tool in researching coin value trends. At times, I had the perception (perhaps incorrectly) the ANA wasn't going to survive. Membership numbers were dropping. Leadership mismanagement was capturing headlines (remember the Christopher Cipoletti debacle?). Lack of enthusiasm and overall stagnation were expected. To me, it seemed as if the entire organization was simply gathering dust. What jazzes me the most is their plan to digitize all 127 years of The Numismatist (the ANA's monthly publication) in a searchable format. I've been kicking around a few ideas for future coin articles, so you can bet I will avail myself to this feature! I endorse the ANA for all coin collectors wanting to "up their game" to a higher level. Annual dues start at $28. Their dues have not been raised in many years. When you consider the benefits of joining the ANA, that is a terrific bargain. The broader market for United States rare coins was modestly higher throughout most of 2014, as the monthly movements of the Rare Coin Values Index demonstrated. However, the buying activity in the upper stratosphere of rare coins took a decidedly positive turn in 2014, according to the Professional Numismatists Guild, a leading industry organization. “The prices realized for U.S. coins sold at major public auctions in 2014 totaled nearly $536 million, surpassing 2013’s record of nearly $393 million, said PNG President Terry Hanlon. Hanlon continued: "We estimate the overall coin market in the U.S. at about $5 billion in 2014. That includes auctions and private transactions made at coin shows, by mail order, online and at coin stores, but does not include numismatic bullion items or the modern coins sold directly by the United States Mint”. Things may be even better in the year ahead. Hanlon went on to say "Several important collections will be offered at auctions in 2015, and I anticipate we’ll again see record prices for so-called ‘trophy coins’ that combine historic significance, rarity and superb condition”. Hanlon's confidence is well-founded. As I have been documenting on this site since 2003, coins in scarce supply with a proven, sustained demand over a long period of time in the past are the coins destined to enjoy the strongest price increases in the future. On Dec 12, we reported the recovery of a time capsule buried in 1795. The Commonwealth of Massachusetts and the Museum of Fine Arts in Boston jointly announced today the 10 pound metal box capsule will be opened at 6PM on January 6th, 2015. Check back here to find out what is inside. Should be exciting! On November 30, I reported on a 1907 Ultra Hi Relief St. Gaudens Double Eagle scheduled to sell on December 16 by Bonhams Auction House. Today, I checked the Bonhams' "Results Realized" publication and it seems as if the prized coin did not sell. It was expected to bring up to $1.5 million. I will keep trying to find out what happened and report back here if information surfaces. The 1877 has been the key date in the ever popular Indian Head Cent series since... well, since Indian Head Cents became peachy keen with collectors. If you've been thinking about add the 1877 to your collection, but for some reason, you've been putting it off, here is something for you to consider. The selling price of the 1877 in Good condition has fallen about 40% since September 2009. What cost you over $1000 five years ago can now be had for around $600 or so. The blue line in the graph below illustrates the precipitous plunge of the 1877. The red line charts the performance of the overall Rare Coin Values Index. Does this mean the 1877 was overpriced to begin with? Hardly. The consistent rise in value over a period of many years was based on real demand vs. a limited supply. It's not all that uncommon that a bona fide key date such as the 1877 takes a breather and pulls back in value. Coin buyers should view this as an opportunity to haul in a classic rarity at a bargain price. The 1877 will someday resume its upward movement, so what we're seeing in late 2014 is a temporary aberration. We have a page devoted to the study of the 1877 Indian Head Cent, recounting the history of this famous key date and its solid popularity with collectors for ages. A time capsule entombed in the granite cornerstone of the Massachusetts State House was brought to light on a cold and snowy Thursday afternoon (December 11). The capsule was originally concealed during a ceremony attended by Revolutionary War heroes Paul Revere and Massachusetts then-Governor Samuel Adams, when the State House was built in 1795. Records show the contents may include coins dating back to 1652, an engraved silver Paul Revere plate, newspapers, a Commonwealth seal and a document from the Massachusetts Colony Records. The capsule remained undisturbed until 1855, when emergency building repairs forced officials to temporarily remove it from its resting place. Once repairs were finished, the capsule was re-interred. A water seepage problem necessitated removal of the cornerstone on Thursday. After several hours of carefully chipping away, a metal box measuring approximately 5 by 7 inches was recovered. During the recovery process, four Seated Liberty dimes were dislodged from the loosened mortar (assuming the dimes were almost new at the time the mortar was freshly mixed). Researchers speculate this discovery may be the oldest of its kind unearthed in the United States. The box will be opened next week by conservators at the Museum of Fine Arts. Eventually, the artifacts will be placed on public display. The Rare Coin Values Index closes out 2014 on a somewhat sour note. The December Index score of 384.39 is identical to November, which had seen the worst one month loss since August 2009. We were hoping to see a rebound. Nevertheless, the Index is still near its all time high of 389.48, set in July 2014. Our Rare Coin Values Index traces price movements of 87 collectible US coins since January 2000. The goal of the Index is to measure the health and direction of rare US coin activity. 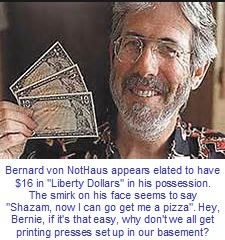 Bernard von NotHaus, the guy who invented the "Liberty Dollar", is not going to the Big House after all. See my Nov 16 blog entry for background information on this case. On Tuesday, December 2, District Judge Richard Voorhees of North Carolina sentenced von NotHaus to six months of home detention, to be served concurrently with three years of probation. The 70-year-old convicted counterfeiter was facing the possibility of spending the rest of his life behind bars. Judge Voorhees rejected the prosecutor's request for a prison sentence of 14 to 17.5 years. The judge was lenient because he believed von NotHaus was overzealously motivated by a desire to make a philosophical point, and had no real criminal intent, as is usually the storyline with money counterfeiters. Perhaps now that von NotHaus' Liberty Dollar career have ended, perhaps he will have more time to devote to another one of his creations: the Free Marijuana Church of Honolulu. A few days ago, a new scientific study was published showing evidence that heavy marijuana use causes brain shrinkage. I am betting one of their subjects upon which their conclusions were based was the Liberty Dollar creator himself. One of the rarest, most beautiful coins in American numismatics is about to cross the auction block. 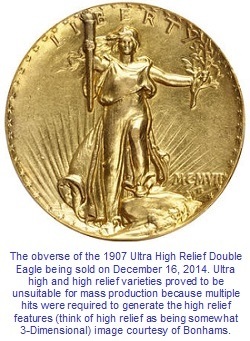 It is a 1907 Ultra High Relief St. Gaudens $20 Double Eagle. Basically, 1907 St. Gaudens $20 Double Eagles exist in three distinct relief types: ultra high (technically a pattern coin), high, and low. There are variants of the ultra high and high relief varieties. Please visit our St. Gaudens Double Eagle page for additional details on this remarkable coin group. This exact same coin sold for $143,000 in 1992. In August 2012, it traded at $1.06 million. This time around, the stunning double eagle is expected to fetch considerably more. These days, many coin value guides include a "GSA" listing for certain Morgan Dollar dates. They do this because GSA dollars are often priced higher than their non-GSA counterparts of the same date and grade. It wasn't that many years ago, no such distinction was made, because value stratification based on GSA status was not widely recognized. The snippet below illustrates how GSA listings appear. This example was taken from Coin World, my favorite price guide publisher. Exactly what is a GSA dollar? No, GSA is not an acronym for "Good Samaritan Action", at least not in this sense. It stands for General Services Administration, an agency of the federal government. Let's take a look at the history of the GSA dollars, analyze their premium values, and speculate on why coin buyers are willing to pay more to acquire GSA examples. In the 1994 movie "Forrest Gump", the title character's mother coined the now famous axiom: "stupid is as stupid does", meaning veritable stupidity is most clearly demonstrated by one's actions. The creator of the so-called "Liberty Dollar", Bernard von NutHouse, errr, rather, Bernard von NotHaus, has carried this truism to new heights. In 1998, von NotHaus founded an organization called the National Organization for the Repeal of the Federal Reserve and Internal Revenue Code, a.k.a. NORFED. Von NotHaus designed "Liberty Dollar" currency and coins and openly placed them into circulation throughout the United States and Puerto Rico. The coins were inscribed with the word Dollar, USA, Liberty, the motto Trust in God, and other elements to resemble authentic U.S. Mint coinage. NORFED's goal was for the "inflation-proof" Liberty Dollar to compete against and reduce reliance on Federal Reserve notes. In all, about $7 million in Liberty Dollars were produced. Most people understand that manufacturing money outside government authority defines the act of counterfeiting, a crime punishable by fine and/or imprisonment. Apparently, this simple supposition was lost on von NotHaus, who boldly exemplified the Gumpian adage in action. Stupid is as stupid does, indeed! Von NotHaus can't be blamed for thinking he might get away with his scheme, for it wasn't until 2005 the Justice Department finally figured out von NotHous was doing something illegal. In November 2007, government officials raided NORFED's headquarters in Evansville, IL and shut down their operation. Von NotHaus was charged with counterfeiting and fraud. In March, 2011, von NotHaus was found guilty in federal court. In his response to the guilty verdict, von NotHaus asserted the verdict was a perversion of anti-counterfeiting laws and reiterated he was only trying to create an alternative to the Federal Reserve system. No wonder the judge denied his appeal (perhaps while quietly pondering the prescience of Forrest's mom). The "Liberty Dollar" counterfeiter will learn his fate on December 2nd, when he appears in court for sentencing. The 70 year old von NotHaus is facing up to 25 years behind bars and a $750,000 fine. We may soon see if he has better luck pitching his economic theories to a captive audience. I will report back following the sentencing hearing. As an avid collector, every now and then I hear about a non-collector discovering a fantastically rare coin in an unsearched holding passed down through generations of family. I freely admit I feel a twinge of jealousy when this occurs: why can't something like this ever happen to me? Once again, I find myself green with envy. The November 24 edition of Coin World reports the finding of a 1794 Flowing Hair Silver Dollar in England. The London auction house Spink stumbled onto the rarity at a "valuation event" on June 13 this year, somewhere in southern England. The people who brought the coin in to Spink were clueless about what they had. According to Spink numismatist Luke Mitchell "the family had no idea as to the value of the coin nor how the coin had been acquired. They did know, however, that it had been with them for at least the last several decades." The newly unearthed rarity is pictured to the right, courtesy of Spink. The 1794 Flowing Hair Silver Dollar happens to be one of the 87 coins tracked in our Rare Coin Values Index. The long term value appreciation of the 1794 dollar is literally off the charts. The 1794 Flowing Hair Silver Dollar is one of the best coins to own in U.S. numismatics. Of the 1,758 pieces struck (per Mint records), fewer than 150 examples are known today. Even in a heavily worn condition, the 1794 dollar commands at least $50,000. The finest known specimen grades Mint State-66 (click here for a primer on grading) and set a record at $10.02 million for most ever paid for a United States coin, when it crossed the auction block in January, 2013. The Spink discovery is all the more remarkable in that the coin was graded by NGC as Almost Uncirculated-50. Not only that, but the Certified Acceptance Corp has slapped it with a CAC green sticker, indicating the coin is at the high level of quality for that grade. Imagine how the family reacted when told their 1794 dollar was worth at least $300,000! Back flips indeed! We won't have to speculate long on the true value of this unexpected, remarkable addition to U.S. numismatics. 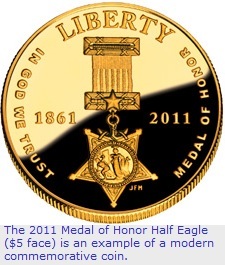 The coin will be auctioned off in New York by Spink on January 27, 2015. I will be sure to report back here on the selling price. 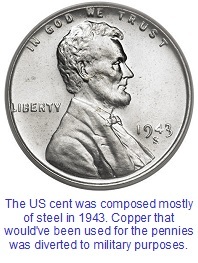 Most experienced coin collectors know the first circulating United States coin bearing the image of a U.S. president appeared in 1909, when Abraham Lincoln was depicted on the one cent penny. Up to that point, the placement of U.S. presidents on American coinage, most especially those still in office, had long been considered a taboo subject. Why was the practice of presidential coinage so totally verboten in U.S. coinage law and tradition? After all, the monarchs of Europe and elsewhere around the world commonly honored their current leaders on coins. How did America evolve so differently? The answer goes all the way back to President George Washington's time. 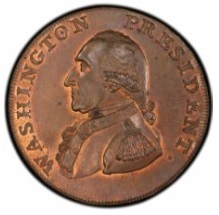 Let's make believe for a few moments and imagine what President Washington might have said when he discovered plans to put his image on United States coinage. An 1839 No Drapery Seated Liberty Quarter in PR65 (NGC) sold today (Oct 27, 2014) for $270,250. There are only two proof No Drapery quarters known, and this is one of them (the other is dated 1838). It was one of the top prizes coming out of the Eugene H. Gardner Collection II Signature Auction, hosted by Heritage Auctions. 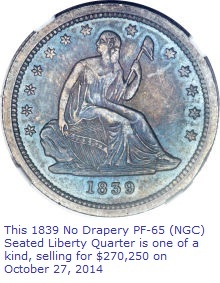 This 1839 No Drapery Proof Quarter was last sold in April 2008, when it brought in an incredible $517,500. It's a safe bet the seller was disappointed with today's selling price. Ancient coins have been around since.... well, since ancient times, dating back thousands of years. In terms of popularity and selling prices, how do the coins from these long bygone civilizations compare to collectible U.S. coins? To gain insight into this question, I isolated some completed sales data from eBay. Every day, many thousands of coins are bought and sold on eBay, so this is a good way to get a reading on coin collecting activity. Not surprisingly, my findings dispelled a common myth held by many in the non-collecting community: that the age of coin has a direct bearing on its value. The data gathered during this exercise strongly suggests otherwise. But some of my other discoveries were news to me. Modern commemoratives have been issued by the US Mint since 1982. Commemoratives are intended to recall an event from history or perhaps raise funds for a particular project. Sometimes politicians use them as tools to pander to certain demographic groups. Every year, the Mint is somewhat successful in marketing commemoratives to the public. I have long wondered how many buyers of these coins think they're making an investment that will pay off in the future? With that question in mind, I started doing a little research. What I found may surprise a few collectors. 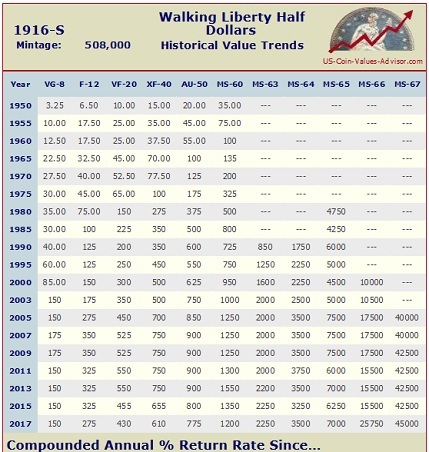 We have now posted coin value tables for individual dates for Seated Liberty Dollars. Retail prices from 1950 to 2014 for individual dates, in conditions ranging from Good to Proof, are reported. Collectors should use the tables to identify which Seated Liberty dollars have shown the best percent price increases over a long period of time. Those dates with the strongest past price increases most likely will do the same in the future. For the first time in 11 years (yes, ELEVEN years), we have added a new chapter to our Coins & History section. The new chapter covers the Reconstruction Era of 1865 to 1877, while exploring how the US coinage system influenced post-war events. American Silver Eagle Bullion coins: What are they really worth?. Read this before buying. Updated frequently. Coin Value Tables for the following US coin groups have been updated to include 2014 pricing data: Flying Eagle Cents, Indian Head Cents, Lincoln Cents, Buffalo Nickels, and Peace Dollars. Our Coin Value Tables display pricing trends from 1950 to the present for individual dates. The highlight of the American Numismatic Association's summer show inChicago occurred Aug 15 when a stunning 1889-CC in MS-68 conditionwas auctioned off for $881,250. This coin was last sold in 2009 for$531,875. The 66% rise in value over a four year period suggests thatthe demand for top rarities remains strong, even if the overall rare coin market is trending flat. On August 9, 2013, an 1804 silver dollar was sold for $3,877,500 by Heritage Auctions. The coin was actually minted in 1834 or 1835, and was intended by President Andrew Jackson as a diplomatic gift to foreign dignitaries. There are fewer than 20 dollars dated 1804 that are recognized by numismatists as genuine. All have their genealogy traced back for many years due to their extreme rarity. This example, named the Mickley-Hawn-Queller Class I dollar, is graded by PCGS as Proof-62, and was sold in 2008 for $3,737,500. Small wonder why they call the 1804 dollar the "King of American Coins." Though the US rare coin market has slowed down in recent months, high profile rarities continue to astound the numismatic community. In July 2013, an 1894-S sold for over $2 million, changing hands from David Lawrence Rare Coins to Legend Numismatics. More details can be found at the David Lawrence blog page. This particular 1894-S is the third finest of the nine or ten survivors of this date. In all, it is commonly believed there were 24 of the 1894-S dimes minted. The $2 million+ figure is the highest price ever paid for a United States dime, breaking the old record of $1.9 million set in 2007 for the same date. US Coin Values Advisor has a page dedicated to the study of Barber Dimes. If the American Liberty Coinage and Deficit Reduction Act (H.R. 2535) passes into law, Americans will be seeing new dimes, quarters, and half dollars in their pocket change starting in 2015, to circulate alongside the familiar faces of Roosevelt, Washington, and Kennedy. Legislators are eyeing H.R. 2535 as a way to reduce the national debt by at least $100 million over a ten year period. When you consider the government is trillions of dollars in debt, this is very inconsequential, but the proposal will more than pay for itself, its proponents claim. Treasury will profit through a complicated process known as seigniorage, defined as the difference between a coin's face and the cost to manufacture and distribute it. In other words, the US government realizes a little positive income for every coin (excluding pennies and nickels -- for their production costs exceed their face values) reaching the consuming public. Recall, the State Quarter program generated hundreds of millions in seigniorage profits above and beyond what would have been realized for quarter production, due to additional demand from individuals who purchased quarters and set them aside for their collection. The proposed law calls for new Liberty-themed coinage with designs "emblematic and allegoric of the concept of 'American Liberty.' " The belief is that individuals would remove some of the new Liberty themed coins from circulation for collecting purposes, spurring additional coin production, and thus increasing seigniorage profits, in a manner similar to what we saw with State Quarters. The law, if passed, would mark a return to the allegorical Liberty, rather than real persons from history depicted on modern coinage. There will be more updates as they become available. Who says the collecting class has no interest in modern-era coins? Top grade Eisenhower Dollars are definitely trending higher these days. Consider the 1973-D in MS-67 sold recently by Heritage Auction. It brought an astounding $12,925! Two years ago, a very similar Ike brought less than half this price. Other top grade Eisenhower Dollars are seeing similar moves upward. Numismatic observers attribute this movement to the maturation of the grading service population reports. Over the years, a lot of data has been gathered, and collectors are now able to estimate with confidence the true scarcity of certain top grade Ikes. Because value (and higher prices!) is attributable to actual rarity, don't view this activity as a passing fad. The story of the elusive 1933 Double Eagle is told. This gold coin is worth millions of dollars. A 1794 Flowing Hair Silver Dollar sold for $10,016,875 on Jan 24, 2013 at the Stacks Bowers Americana Sale. Researchers believe this coin, graded MS66 by PCGS, is the first silver dollar struck by the US Mint. The $10 million price is the highest ever paid for a US coin, eclipsing the previous record of $7.85 million paid in May 2010. Interestingly, it was this exact same 1794 dollar that set the record in 2010. The War of 1812, often called the Second War for Independence, began 200 years ago. As we observe the bicentennial of this lesser known event from American history, let's also take a closer look at the coinage from that time. New information has been added to our "Money of the Civil War" chapter. Write ups on the Confederate Cent and other Confederate coinage are now included along with images. 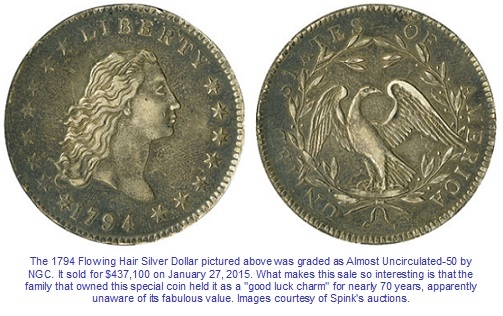 On May 14, a 1794 Flowing Hair Silver Dollar was sold for $7.85 million. This is the most ever paid for a coin. The dollar is believed to be the first silver dollar minted by the United States. It is the finest known example of this rare date, grading MS-66 by PCGS. We have developed a new feature called the Rare Coin Values Index. The Index is designed to measure the overall direction of the US rare coin market. The Index tracks price trends from the year 2000 to the present. Updated monthly. On Jan 8th, a 1913 Liberty Nickel was sold at auction for $3.74 million. This nickel is known as the "Olsen specimen", and was once famously owned by King Farouk of Egypt. Of the five known examples of this exceedingly rare date, the Olsen specimen is the second finest, grading PF-64 NGC with CAC sticker. This particular coin gained notoriety after appearing in the television series of "Hawaii 5-O" in 1973. The name of the episode was The "$100,000 Nickel". In observance of Abraham Lincoln's 200th birthday, the US Mint is issuing cents with reverse images depicting scenes from Lincoln's life. In all, four reverse designs will be released. A young numismatist presents a video tour of the American Numismatic Museum in Colorado Springs, CO. The historic New Orleans Mint, opened for business in 1838, suffered damage from Hurrican Katrina in August 2005. This article describes the efforts to get the venerable building repaired and open to the public once again. A scientific inquiry into the extra leaf error on a small number of 2004-D Wisconsin State Quarters yields evidence of the probable cause. The United States Mint issued the 2006 San Francisco Mint Commemorative coins. Both silver dollar and five dollar gold coins were made to honor the old Mint's place in history, in particular its role in helping the city of San Francisco recover following the devastating earthquake of 1906. The coin is closely patterned after the Buffalo nickel, minted from 1913 to 1938. On January 12, 2006, the U.S. Mint released into circulation a new Jefferson Nickel. The 2006 Jefferson nickel is the first of its kind in how the presidential portrait is seen. Two new new silver dollars are being issued to celebrate the 300th anniversary of the birth of Benjamin Franklin in 1706. A method of determining U.S. coins destined to rise in future value faster than average is outlined. Webmaster Daniel Goevert takes a nostalgic journey back to the 1960's to describe how his grandmother helped nuture his interest in coins. In the 1980's, coin telemarketing fraud was running rampant. Webmaster Daniel Goevert explains how he got sucked in too. 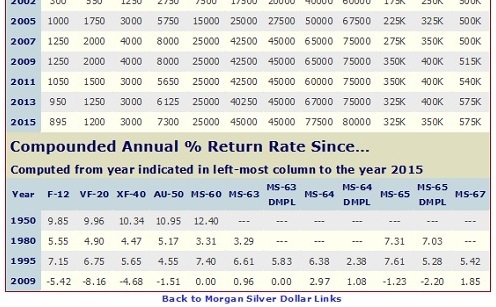 Morgan Silver Dollars rate near the top in terms of collector interest. Surprisingly few dates advance solidly over time due to their numismatic character. Here are some of the best.